Ah, an 18th century female-driven novel–I am there, obviously! I was eager to dive into this one given the subject matter. And, I learned a lot from this book, historically speaking, even though I like to think I know quite a bit about the Revolutionary period ;). For some reason, and I don’t know if this is a widely known thing or not, but I never knew that Sally Hemmings was the half-sister of Thomas Jefferson’s deceased wife! I know there is still debate among historians if Jefferson had a relationship and children with Hemmings, but in my opinion the history is quite clear–he did. And while this issue is complex given the implications of him being a slave-owning proponent of liberty, equality, and freedom–I was very pleased that America’s First Daughter does not gloss over this matter. In fact, this paradox is often a point of philosophical and spiritual contention within Patsy’s own mind and in how she interacts with others in the political forum. This dichotomy of her father is just one example of all the problematic points Patsy internally wrestles with while outwardly proving utter loyalty and devotion to her father for the sake of love, reputation, and legacy–and to keep the promise she made to her dying mother to look after him. Dray and Kamoie do not present Patsy in a sugar-coated or romantic way, but rather paint her as a woman of her time. Patsy is loyal, devoted, and obedient–she is the picture of a young lady in society, and later, the image of Republican motherhood–often times to the detriment of her own well-being. As modern readers (perhaps especially as a modern woman reader), we are prone to become frustrated with Jefferson’s daughter. Why does she remain loyal and devoted to men who treat her poorly, why doesn’t she readily call out hypocrisy, why does she consent to continue to benefit from slavery when she claims to oppose it? Why–because she is a woman of her time. And, given the context of the period, her status, and geographic location…she’s honestly probably not as bad as the rest of the landed gentry who are lacking in both self-awareness and compassion. 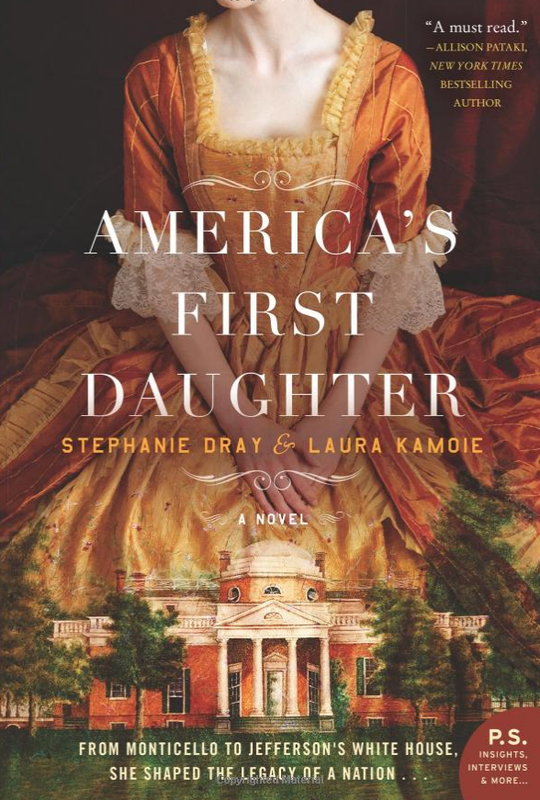 I have to view America’s First Daughter in two parts: 1 – Patsy as a young girl during the American Revolution and her coming of age in Paris, and 2 – a grown woman and mother navigating financial hardships and social politics in Virginia plantation society. I favor the first part of the book not only because I am partial to revolutionary back drops and coming of age stories, but also because I felt Patsy as a girl and a teenager was more visceral and emotional. There are more actual scenes between characters and more “showing” in the first part of the book. The second part, however, where Patsy beings her life as a woman in Virginia often felt quite rushed and unemotional. At first we are eased into this new life, much like Patsy, but then the years just begin to fly by with merely glancing interactions with family members and the birth of children. I felt like I didn’t get to stick with any period of time or actual scene long enough for any emotion to really land and take hold (with the exception of the domestic violence incidents and the death of a family member). This impression may be due to the fact that as a woman of her time, Patsy often has to bottle up her true thoughts and feelings in order to serve others and maintain face and reputation. Technically speaking, the second part of the book is quite “telling” in that I felt there was too much summarization of events with only very fleeting scene interactions between characters. Glossing over time periods may be due to the fact that the storyline is driven by and based on actual letters Jefferson exchanged with his daughter and others. Because of this stylistic choice, I didn’t feel the later chapters to be as visceral or emotional. And maybe that’s because as a kid and teenager things are more emotional–again, I don’t know if this was a stylistic choice or not. Also, I am probably more partial to the scene by scene, intricate detail drawn style of writing associated with Diana Gabaldon or Sara Donati. The bottom line for America’s First Daughter, however, is that it is engaging from start to finish. This book is certainly one that you will be excited to dig into due to the complexity of the time period and its historical figures, and doubly so as it is seen from the eyes of the person closest to one of America’s most famous founding fathers.